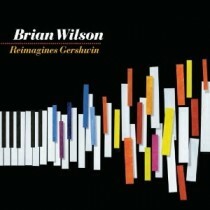 Brian Wilson Reimagines Gershwin is the quintessential signature sounds of Brian Wilson (co-founding member of the Beach Boys), elegantly combined with the timeless classic melodies of some of the most revered songs from George and Ira Gershwin. Wilson has re-recorded and re-imagined twelve classic songs from the Gershwin Brothers and collaborated on two new Wilson/Gershwin compositions. The Gershwin estate gave Wilson access to rare, unfinished pieces of music by George Gershwin, with which Brian crafted collaborative compositions unlike anything the world has heard with “The Like in I Love You” and “Nothing But Love”. Wilson chose to record George and Ira Gershwin songs because he considers the late composers of classics like “Someone to Watch Over Me,” “Rhapsody in Blue” and “Summertime” as a critical influence on him.